Previously, for transitions between different activities and fragments for enter and exit transitions, we used fade animation, slide animation or any other animation. A shared element transitions determines how shared element views are animated from one activity to another activity or fragment to fragment. A share element transition helps users to go different screens through your app by defining a focal point as they go different screens. This share element transitions is only available on android lollipop and above (API level 21+). In this tutorial, you will learn to implement a kind of animation transition, Share Element transitions between different activities. You can implement it between Fragments, RecyclerView and so on. Here we are going to create two different activities MainActivity and ActivityTwo. First activity contains an image and a button. When button is clicked the new activity ActivityTwo is launch. This second activity loaded everything about transitions. Second activity contains everything that you want to show to the user, In this example I will show a image in ImageView and text in TextView. 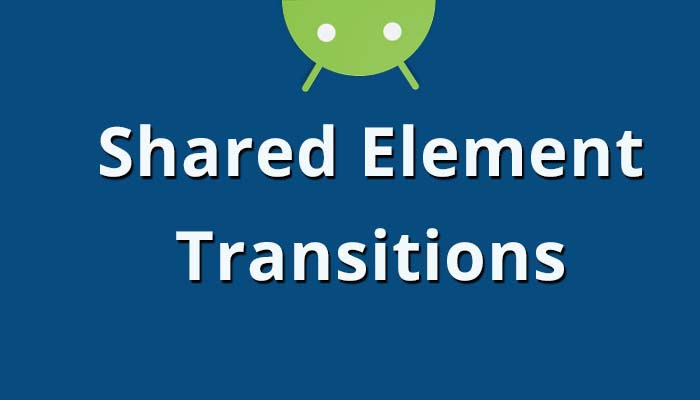 Let’s start by creating new android project to implement shared element transitions between activity to activity in android app. First you need to enable window content transitions. For that open your styles.xml file and add android:windowContentTransitions true. Open your activity_main.xml file and add an ImageView with id, layout_width, layout_height, src, transitionName, etc. and a Button with an id, layout_width, layout_height, text and so on. Your activity_main.xml file will look like below. Now create a new XML layout file called simple_transaction_activity_layout.xml and add an ImageView & a TextView. Open your MainActivity.java file and define ImageView, Button and so on. Screen transitions animation is implementing inside on button click listener. Now create a new java activity file called ActivityTwo.java. Here you don’t need to do any more things just in setContentView to the second XML layout file. Now, run your Android Shared Element Transitions app by clicking run icon. After launching your app, click the button, there will open a new screen with animation effect. This animation effect can be seen when you come back to previous activity. If you want to know more details about this you can found here, a article by Mike Scamell.